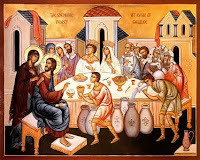 I love that story of the Wedding feast in Cana. It says so much. And your add in is probably what he was thinking.I would like to see the expressions that are on their faces during this moment, when she asks him to make more wine. But I wonder why she would have to tell Jesus to do this? Wouldn't he have known. I always think he was psychic and should have known this stuff. "Do whatever he tells you"... This wasn't just something Mary SAID, it was also something she DID. Think of her response to the angel at the Annunciation: "Here am I, the servant of the Lord; let it be with me according to your word." I pray we can all be that faithful! Another great post. Those words always hit me too.... "Do whatever he tells you...." Every word that came from Mary's mouth was filled with wisdom!